Last year Isabel and WHO talked about healthcare services in general, and how everyone can improve their communications and services for patients, for staff, and even for governments as a whole. This year, WHO are really honing in on how UHC can be achieved, which they believe is largely through primary care services. Primary care is able to cover a majority of health concerns and issues over someone’s life, and is therefore the basis for good, effective healthcare. In many countries however, it is the most underfunded sector of healthcare, with much more money having to be invested into emergency medicine, the costly running of hospitals, and getting access to treatments. If we are able to improve primary care globally, it is thought we can get ahead of the curve and save more money and more lives. 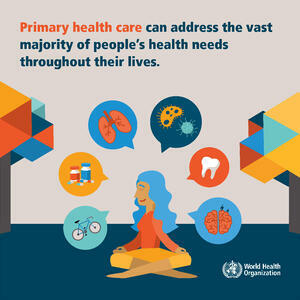 This is because good primary care can help patients improve their overall health, preventing many health concerns from becoming worse, identifying and diagnosing diseases sooner so the treatment is more effective and less costly, and, in some cases, reducing numbers of cases in infectious diseases overall. Universal Health Coverage starts with primary care and that’s something that we’re all to happy to campaign for here at Isabel. Isabel Healthcare was established, first as a medical charity, in 1999, after co-founder Jason Maude’s daughter was near-fatally misdiagnosed with chicken pox, with doctors having missed the life threatening complication of necrotizing fasciitis. Instead of taking legal action against the hospital, Jason Maude established a charity to help improve diagnostic processes and allow doctors to do their job in the best ways they can. He then developed a tool, encompassing the most modern technology and algorithms, to help pool resources and suggest rarer diseases to doctors before it’s too late. Doctors could then ask the question ‘what else could it be?’ without spending many precious hours researching. We have so much more knowledge on diseases and treatments than we did even 10 years ago, and our medical research is only accelerating, with new technologies and medicines, as well as more disease strains, being discovered all the time. With this knowledge, the burden and difficulty for doctors to be able to diagnose everyone is greater as well. In primary care, a doctor may see hundreds of patients a week, many of them with common conditions that are easily diagnosed. It is when those rarer patients come through the door, or a rarer disease is missed because it shares symptoms with a common condition, that Isabel can help. We had a guest blogpost from Professor Aneez Esmail a while ago, where he talked about how he utilises Isabel in his primary care setting, which you can read here. We think Isabel can really make a difference in the primary healthcare sector, saving time and money whilst improving efficiency.